International Journal of Research in Health Sciences,2015,3,1,199-204. 1-Associate Professor, Department of Anesthesia, 2-Assistant Professor, Department of Pediatrics, 3-Assistant professor, Department of Anesthesia, Government Medical College, Anantapuramu, A.P., INDIA. Objective: To compare the effects of spinal and general anesthesia over Apgar score of newborns delivered by elective cesarean sections. Materials and Methods: This prospective randomized study conducted on 60 pregnant women belonging to American society of Anesthesiologists (ASA) Grade I criteria admitted at Government Medical College, Anantapuramu between June 2014 to December 2014, for whom elective cesareans were planned after 37 weeks gestation, were allocated randomly, after their informed consent, to spinal or general anesthesia groups. Thirty patients given spinal anesthesia and other thirty patients received general anesthesia. 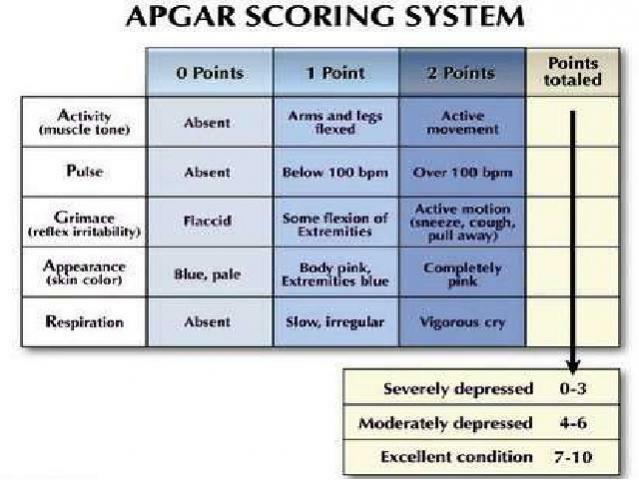 The Apgar score was recorded at 1 minute and 5 minute interval after each delivery. Results: An Apgar score > 7 was observed at 1 and 5 minutes in 22 neonates (73.33%) and 30 neonates (100%) respectively in spinal group while it was 10 neonates (33.33%) and 28 neonates (93.24 %) in general group. An APGAR >7 was observed in significantly more neonates in spinal group at 1 minute (p- 0.00095)and statistically less significant at 5 minutes(p-0.2360) interval. Apgar score at 1 minute were found to be lower for the general group than spinal group and need for respiratory assistance was greater for the general group. However at 5 minutes, no statistically significant difference was noted between the two groups with respect to Apgar score or outcome of neonates. Conclusion: There is a significant difference between the spinal and general group on Apgar score of neonates at one min interval after birth, but there is no significant difference at 5 min APGAR between the two groups. Neonates with low APGAR at one min improved with free flow of oxygen and bag and mask ventilation. Anesthesia type does not seem to influence the short term outcome of the newborn infants for elective cesarean deliveries. We believe that both spinal anesthesia and general anesthesia could be performed in elective term cesarean deliveries without any risk to the newborn infants.